How's this for a full touchscreen BlackBerry 10 Bold? Earlier this year we held our DreamBerry contest, where readers submitted their vision of what the ultimate BlackBerry would look like. We saw a lot of cool concepts, including my favorite that was submitted by the talented John Anastasiadis. Months later, we're still dreaming about BlackBerry, but now our dreaming is more laser-focused on what the first BlackBerry 10 phone will look like. Based on the BlackBerry 10 Dev Alpha device, we know it will be full touchscreen phone which, like the PlayBook tablet, will have no buttons on the front (gotta love gestures!). We also know that for BlackBerry, the Bold has been their flagship line up of phone and that with the BeBold campaigns they have been further trying to build strength into both the BlackBerry brand and the Bold name. What we don't know yet is how RIM will brand and position BlackBerry 10 phones when they hit the market. Will they introduce a whole new product family for BlackBerry 10? Or will they introduce BlackBerry 10 models to the existing Bold, Torch and Curve families. Or, maybe they'll do both. For this design I wanted to marry the Bold 9900 with the Dev Alpha device while keeping the design "agressive yet approachable". The best part of the Bold 9900 is the aluminum outer band that is chamfered. This has a nice look that makes the unit look thin and strong. In this rendition I've anodized the aluminum. The back side has a nice texture that BlackBerry's have had on various models. I know looking at renders like this is torture when we're still months away from getting our hands on the real deal, but in the meantime it's a fun way to kill the time. So what to do you guys and gals think? I know I am loving it. It almost exudes a military grade toughness, which I love (the same sort of emotional reaction I have to my Bell & Ross BR-O1 watch). 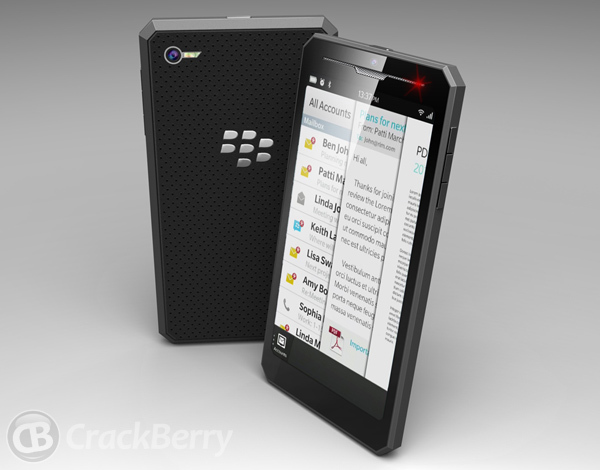 We always say BlackBerry is a tool to get sh!t done, and I think a design like this plays well to that. Though I do think this same design in WHITE could look hot too.